Fill your soccer ball, basketball, football, or toy ball with air. Simply screw included needle into base of plastic hand pump, then pump the ball full of air. Also included are a variety of attachments to inflate a bike tire, air mattress, or rubber balloon. Package Weight: about 4.9 ounces. If you're ordering a soccer ball, basketball, football, or toy ball, you'll need to fill it with air before the fun can begin. 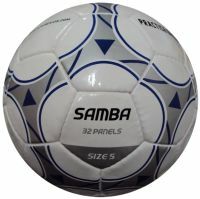 In addition, if you want to take a ball with you to a picnic or camping trip, you'll want a small, convenient way to inflate it once you reach the field. And here is just the thing. Simply screw the included needle into the base of this plastic hand pump, and after a few strokes the ball will be filled with air ... and ready for action. A variety of attachments are also included with this package, so whether you need to inflate a bike tire, air mattress, or rubber balloon, you'll turn to this pump every time to get the job done - quickly and easily. Directions for the Hand Pump From Future Aids, The Braille Superstore. Our miniature hand pump comes complete with several attachments, which you may find useful for inflating small pool toys, air mattresses, and the like. 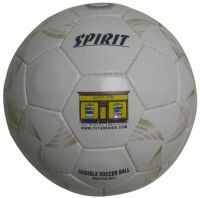 Today, however, we will give you a few tips on using your new pump on a sports ball, like a soccer or football. Inside the package, you'll find a flexible cord, about five inches long. a one-inch needle is on one end of the cord, and a threaded screw is on the other. Screw this into the bottom of the pump, and tighten firmly. It's also a good idea to tighten the needle on the other end of the cord, to make sure no air leaks out while you're using the pump. Now, insert the needle into the cork of the ball, support the base of the pump with your left hand, and move the handle up and down with your right. Depending on the size of ball you're inflating, it should be ready to roll in 20-35 strokes. 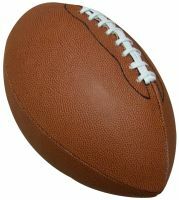 Should you want to deflate a ball, so you can take it on a road trip for example, simply unscrew the needle from the bottom of the cord, and push it into the ball's cork. You may need to press down on the ball to force all the air out, but the needle will hold open the check valve so air will escape easily. Lastly, because this is a small hand pump (the cylinder is only six inches tall and an inch and a half wide) children under eleven may have difficulty using the pump. Sometimes, however, kids won't take No for an answer. They may have more success if you unscrew the needle from the end of the cord, and screw it directly into the base of the pump. 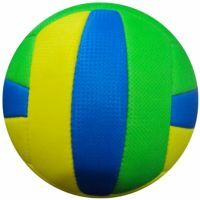 Younger children (perhaps between the ages of eight and ten) should now be able to inflate their ball by holding it between their knees, and pressing down on the handle to force air into the ball. In this way, they won't have to support the base of the pump with one hand. 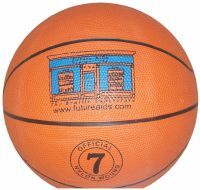 Care should be taken to keep the ball from moving, however, or the pump's needle may bend or even break.